The Tramway du Mont Blanc or the Mont Blanc Tramway is a mountain railway in France. It is the highest railway line in France and one of the highest in Europe as well. 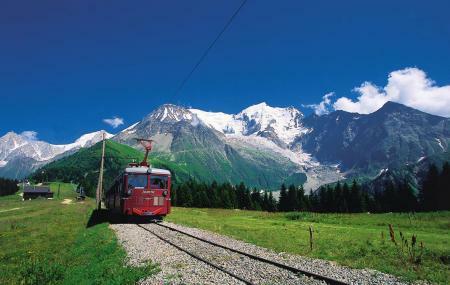 The magnificent view of Mont Blanc that the tram route offers makes this journey very popular with the tourists. Inaugurated in 1909, the Mont Blanc Tramway is one of the oldest mechanical uphill rides in the valley. Adult (16+)- €35, Children (4-15)- €29.80. The mentioned prices are for return trip. How popular is Tramway Du Mont Blanc? People normally club together Aiguille Du Midi and Merlet Animal Park while planning their visit to Tramway Du Mont Blanc. Fantastic views of the peaks glaciers and sheer slopes! Great way of getting half way up mt blanc, if you fancy cheating. Took this trip to explore more of the Mont Blanc range and wasn't disappointed. Incredible journey up the side of the mountains, sharing the trip with mountaineers who were off to the summit. Good choice of walks from the top - clothing for cooler weather & good footwear essential. Fantastic tramway with amazing views of Mont Blanc, the valleys below, and the towns nearby as you ascend on its west side. You definitely want to be on the right side on the way up and the left side on the way back down for the best views. Bring your lunch and take the 11am tram up and the 2pm tram back down if you don't plan to hike much, otherwise give yourself more time. There are cafes and restaurants, but if you cam,.pack your own!